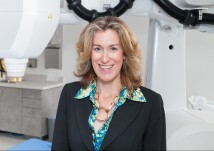 Dr. Ana Grace is one of our Radiation Oncologists at the Pasadena CyberKnife Center. She earned her Bachelor of Science Degree in Biochemistry from California State University Fullerton and her MD Degree from University of Wisconsin-Madison. She completed her residency training at the University of Southern California and the University of Arizona. Dr. Grace is Board-Certified by the American Board of Radiology. Dr. Grace also practices at White Memorial Hospital. She serves as Cancer Liaison Physician for the American College of Surgeons. Dr. Grace is fluent in Spanish and has a special interest in Gynecological malignancies. – Representative Schiff, honoring Dr. Grace on her “Woman of the Year” honors. Dr. Grace discovered her passion for helping others at an early age. Upon receiving a Bachelor of Science in biochemistry from California State University, Fullerton, she went on to attend medical school at the University of Wisconsin and completed her residency at the University of Southern California and the University of Arizona. Dr. Grace has dedicated much of her time in reaching out to senior citizens and the Spanish speaking population. She has made numerous presentations to senior citizens regarding cancer awareness, screening and prevention. With her Spanish speaking skills, Dr. Grace has also been able to communicate medical information about common malignancies to the public, with the ultimate goal of reducing the risk for cancer and emphasizing early diagnosis. Dr. Grace has discussed various topics such as cancer awareness, the effects of secondhand smoking and the recent nuclear emergency in Japan on Spanish news stations such as Univision, Telemundo, and Azteca.